tpdnews: Fugitive from New Jersey arrested by TPD at South Station. Fugitive from New Jersey arrested by TPD at South Station. On January 30, 2019 at approximately 1:30PM Transit Police officers assigned to the Central District received a radio call to respond to the MBTA's South Station CR, track 1, for a disturbance. 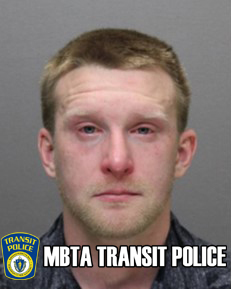 Upon arrival officers were met a Keolis conductor who informed them a male, later identified as Taylor Cox, 31, of Stoughton requested to ride on the train for free. When the conductor refused his request Cox became agitated, aggressive and shouted foul language at him. Officers approached Cox and after identifying him discovered there was an extraditable warrant for his arrest issued from Bergen County, New Jersey for 2 counts of Aggravated Assault on Law Enforcement, Threats and Resisting Arrest. Cox was placed into custody and transported to TPD HQ for the arrest booking process.